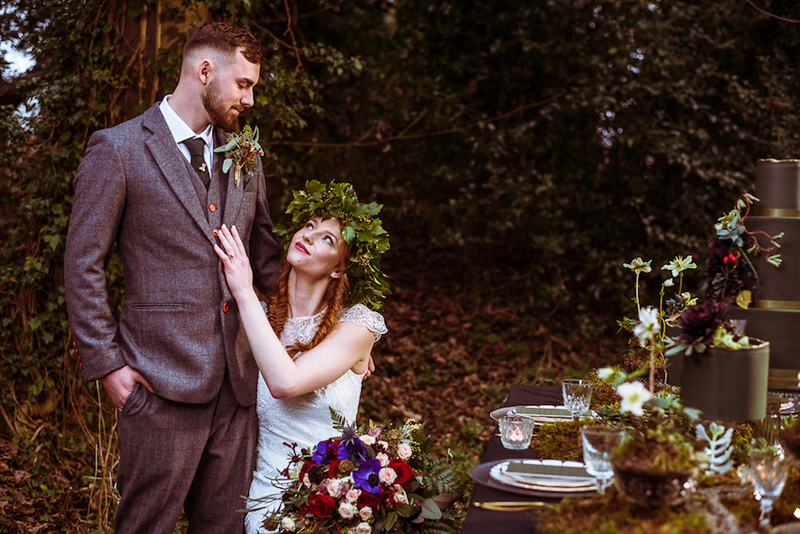 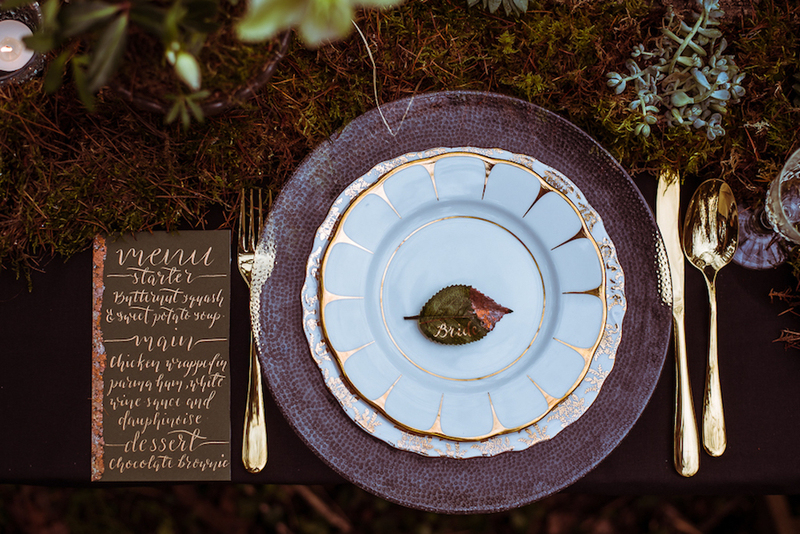 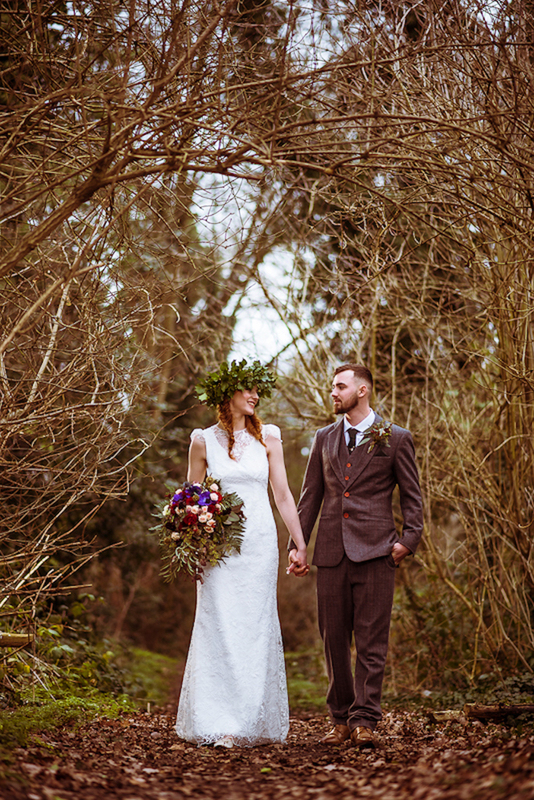 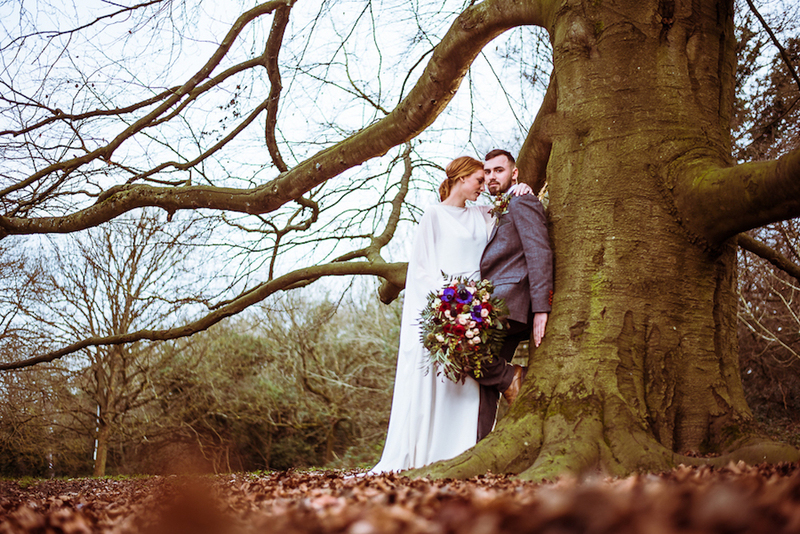 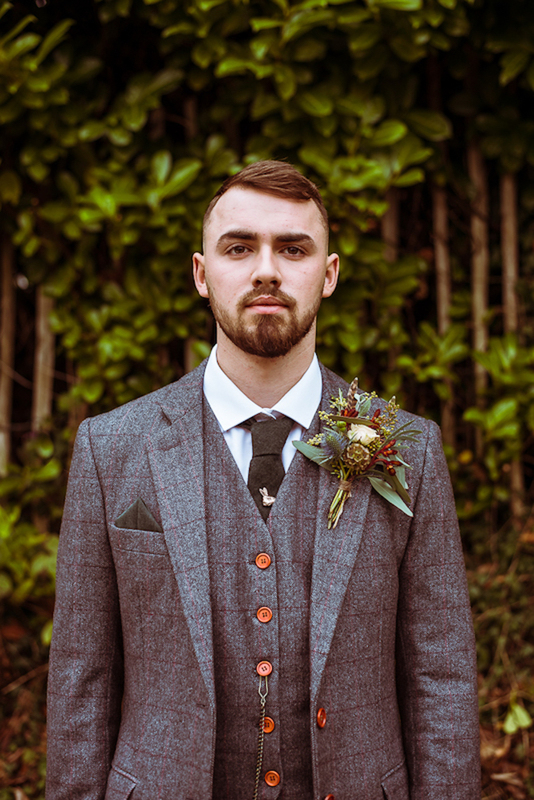 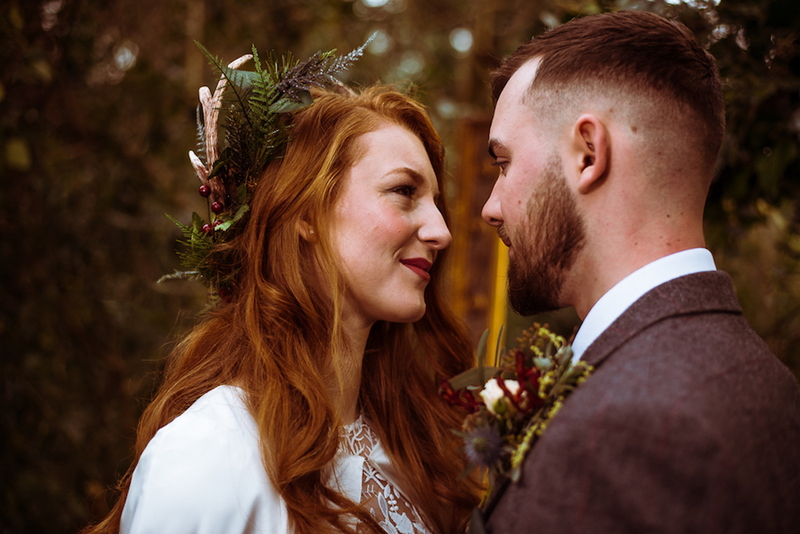 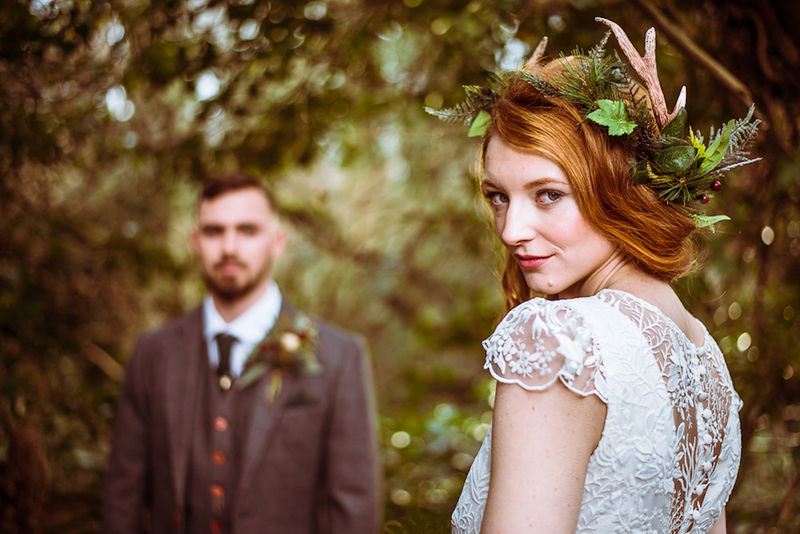 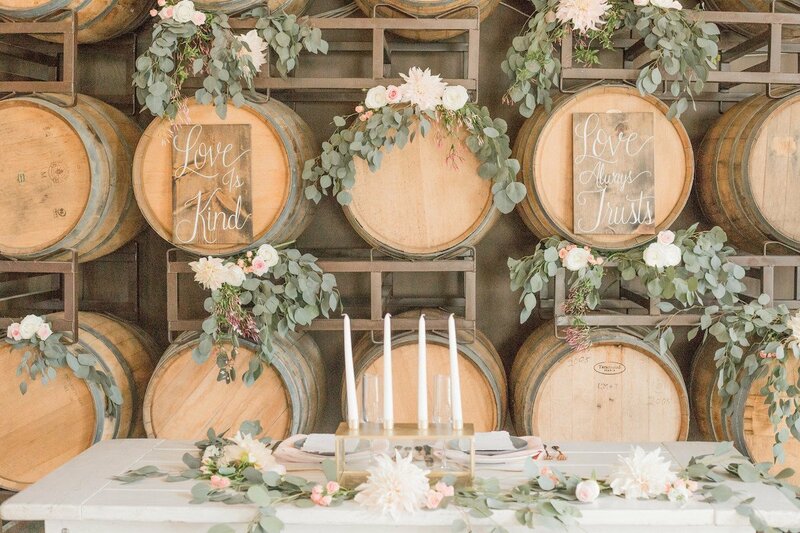 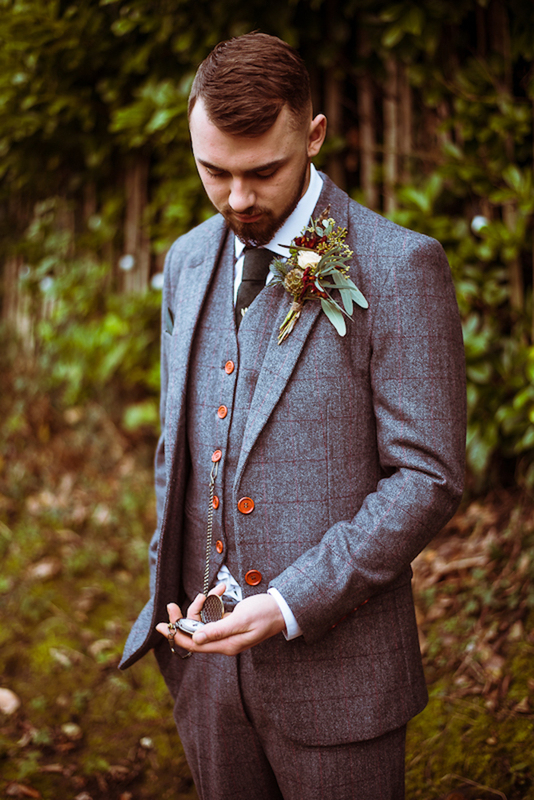 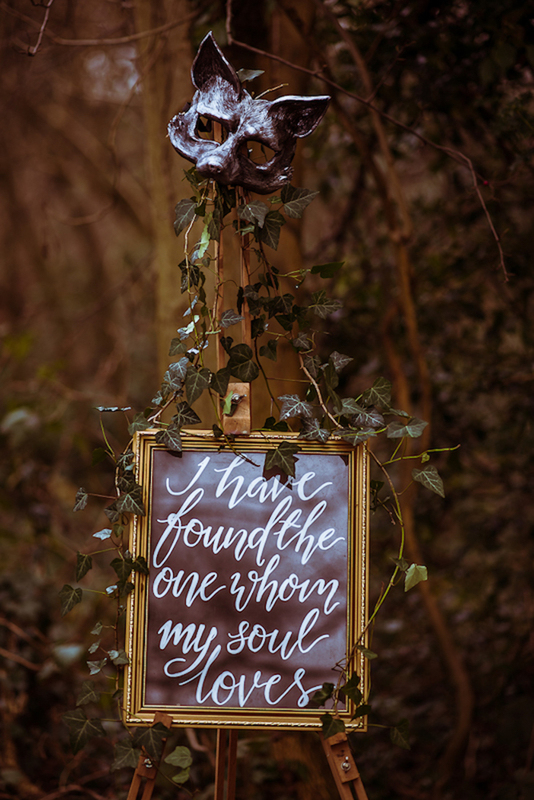 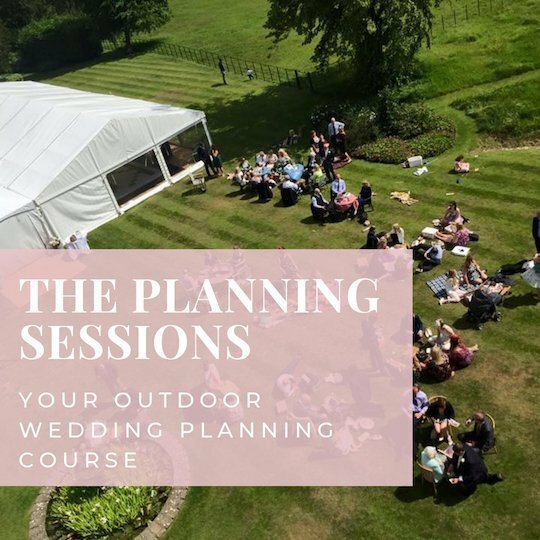 I believe woodland weddings in the depths of winter can still be warm and sumptuous and I wanted the almost bare, rustic backdrop to be enhanced by the moodiness of dark, earthy tones, botanicals and metallic accents with masses of green foliage. 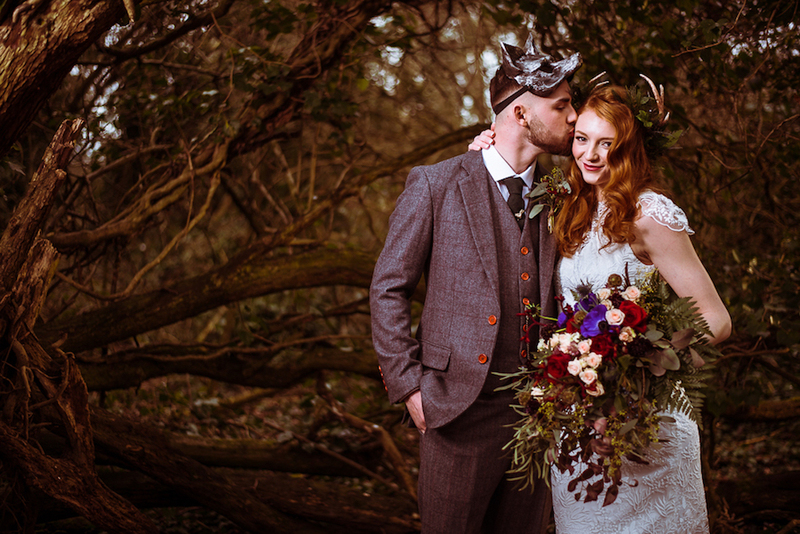 I love Stephen’s photographic style and felt that he was the ideal photographer for this bold shoot. 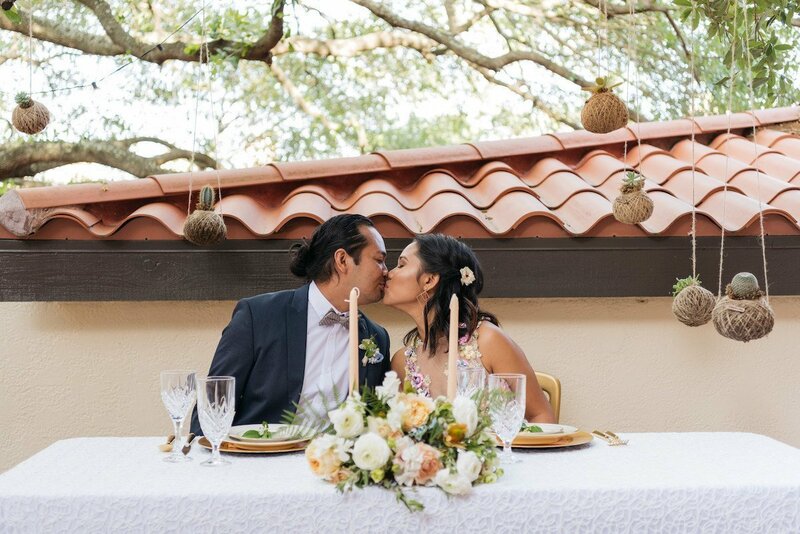 The way he uses light enhanced the setting perfectly. 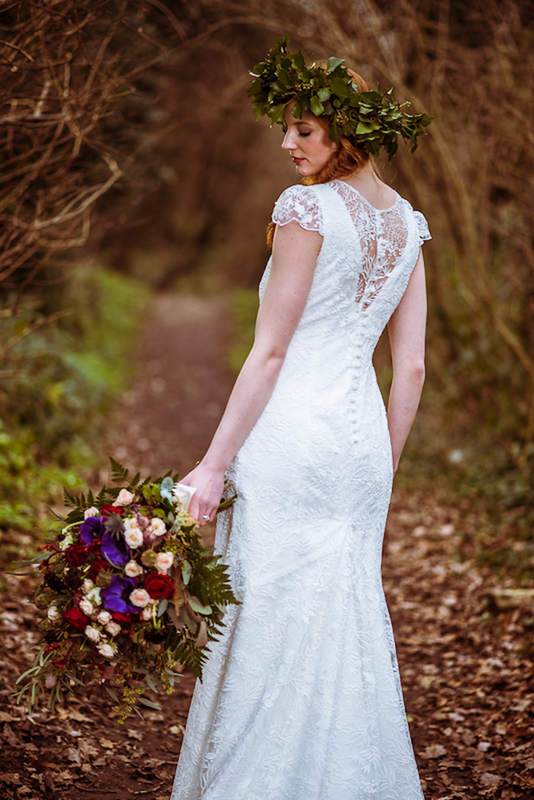 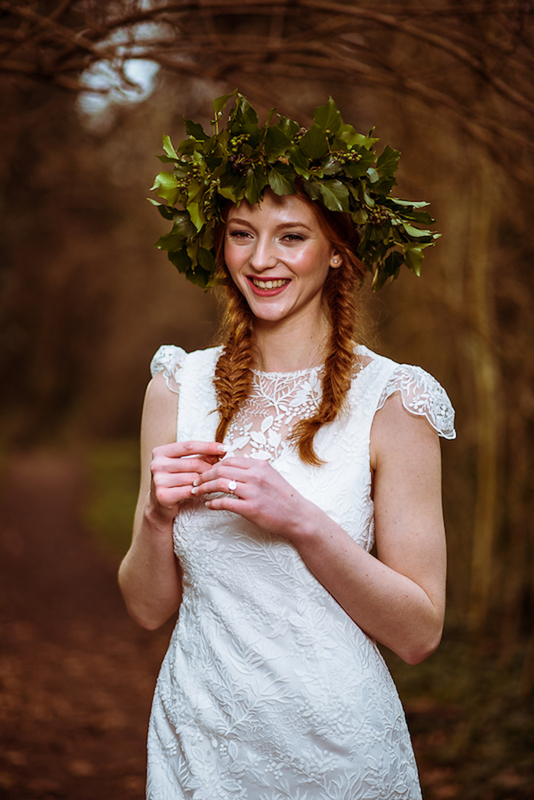 I chose the Thea dress, an embroidered tulle lace featuring woodland embroidery of leaves, fern fonds and berry clusters, a dress from my Made to Measure collection. 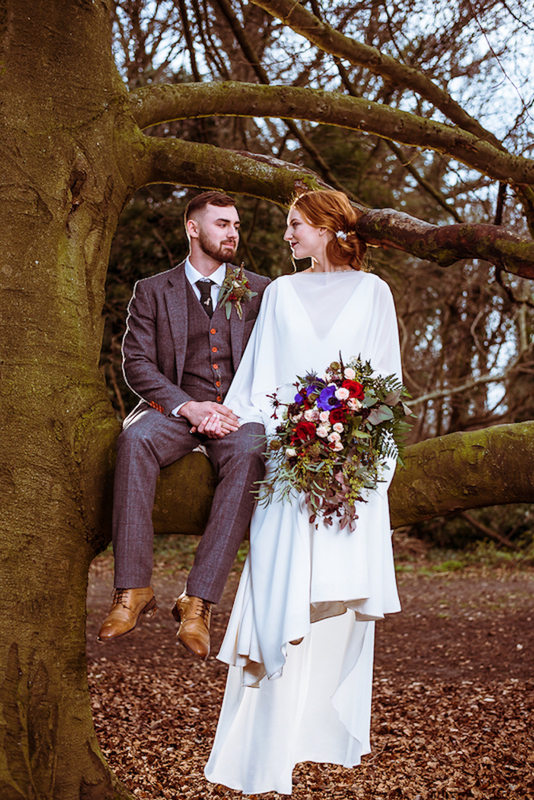 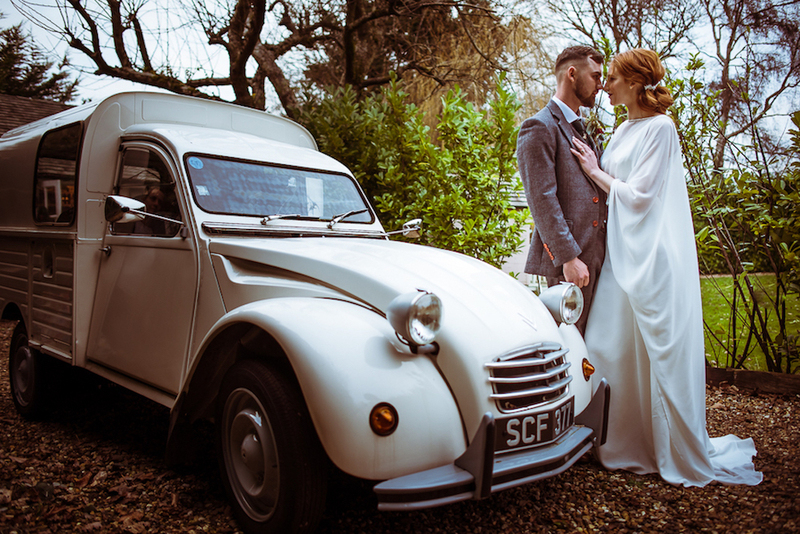 Capes are ideal for this season and this dress worked perfectly with a simple, full length, soft silk satin one, ideal to keep the bride warm. 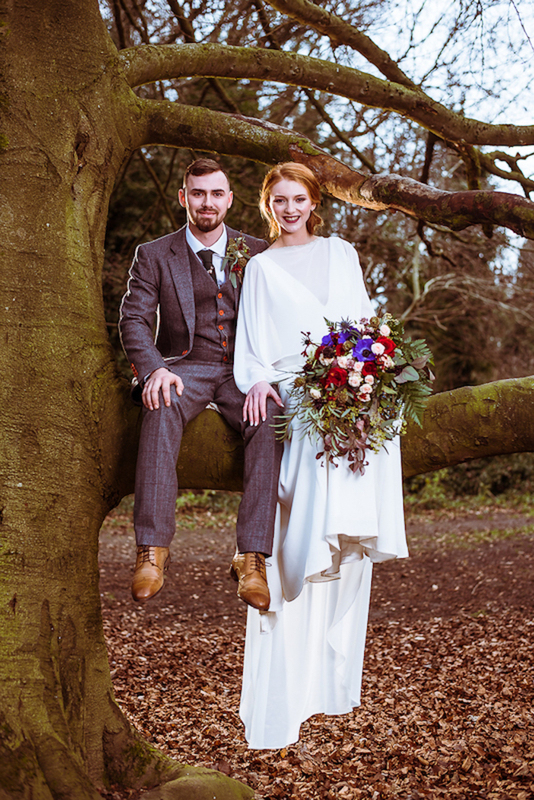 Amber also wore the Eve dress, an elegant crepe gown paired with a modern georgette cape adorned with silver bead trim. 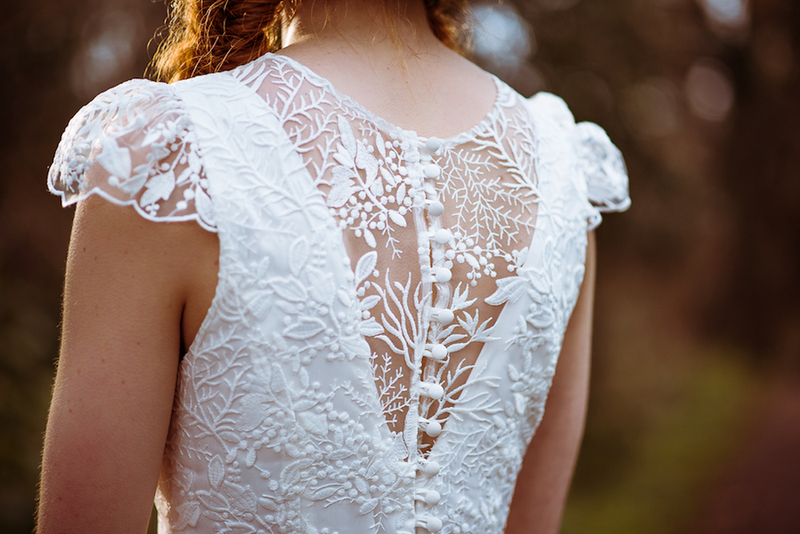 Beautifully simplistic in style. 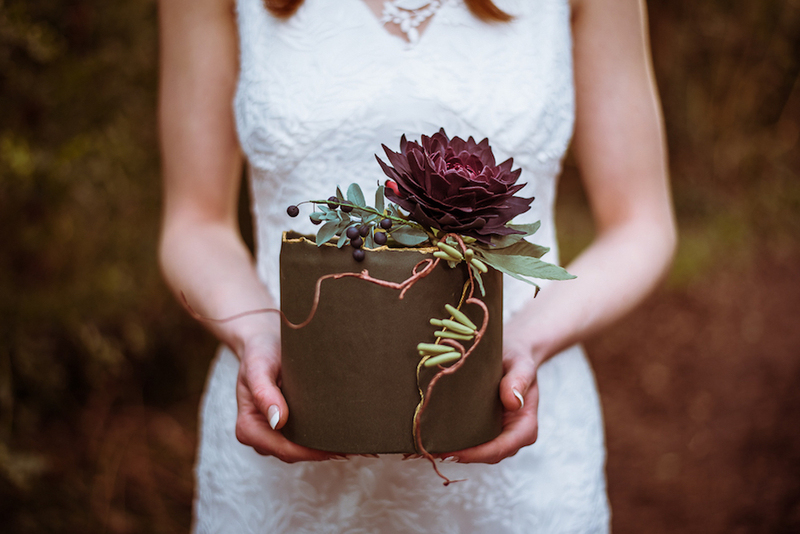 Both are soft, fluid pieces that have a modern vibe. 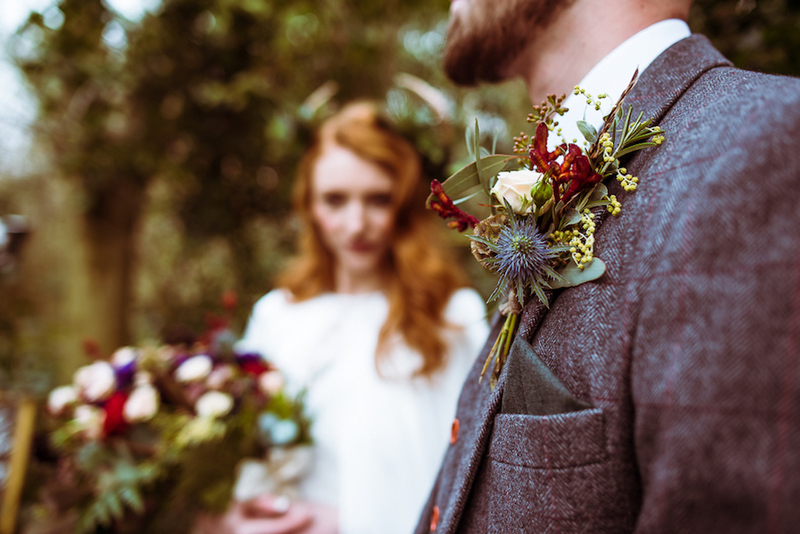 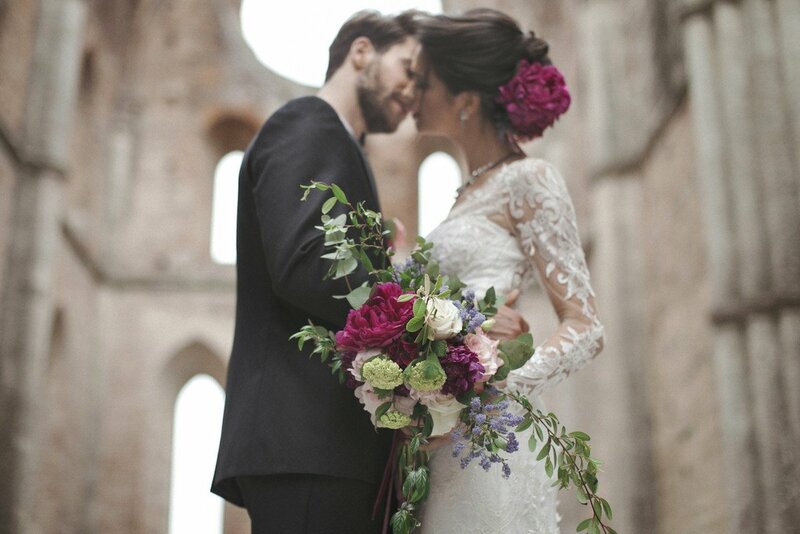 Amber’s green bouquet had deep purple scabious, anemones and red Naomi roses to give pops of colour. 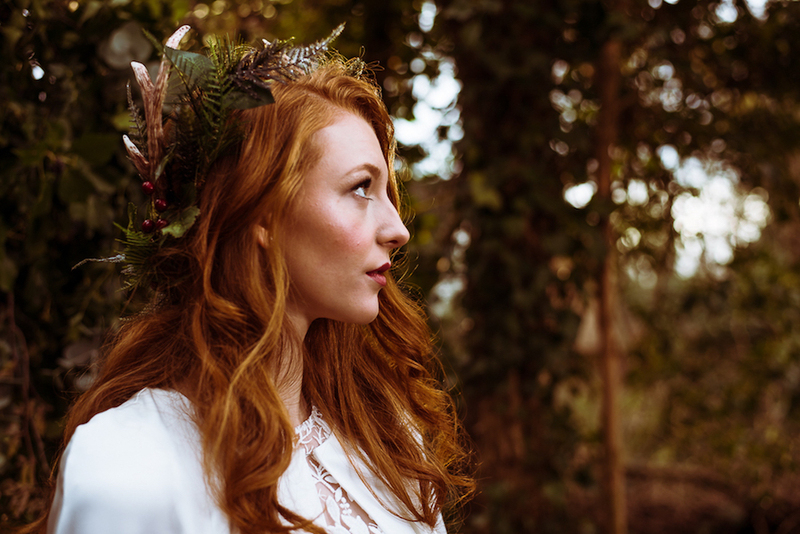 Our HMUA, the talented Natalie Danielle gave Amber, the model multiple looks from Hollywood screen siren, complete with festival crown to sophisticated bohemian, using soft, natural makeup and hair. 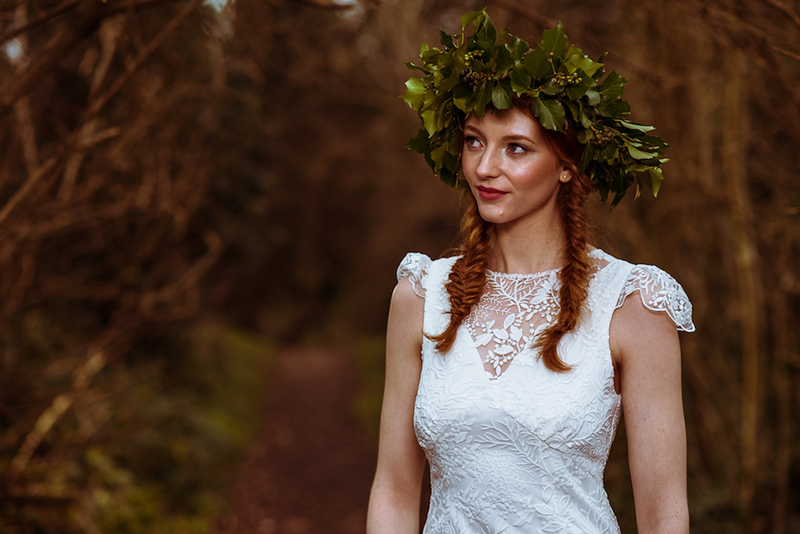 I loved the fishtail plaits with heavy ivy crown and copper makeup palette. 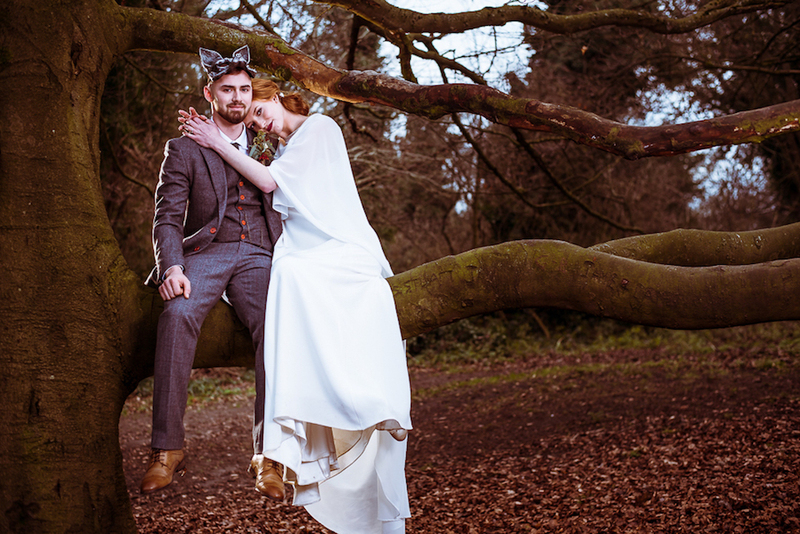 This shoot allowed me to work with some new creative talent that I knew would enhance the story and also add a little fun. 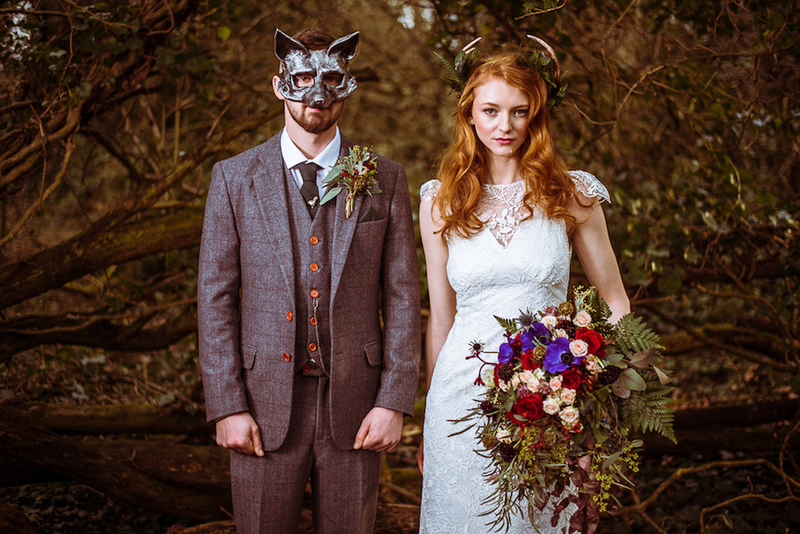 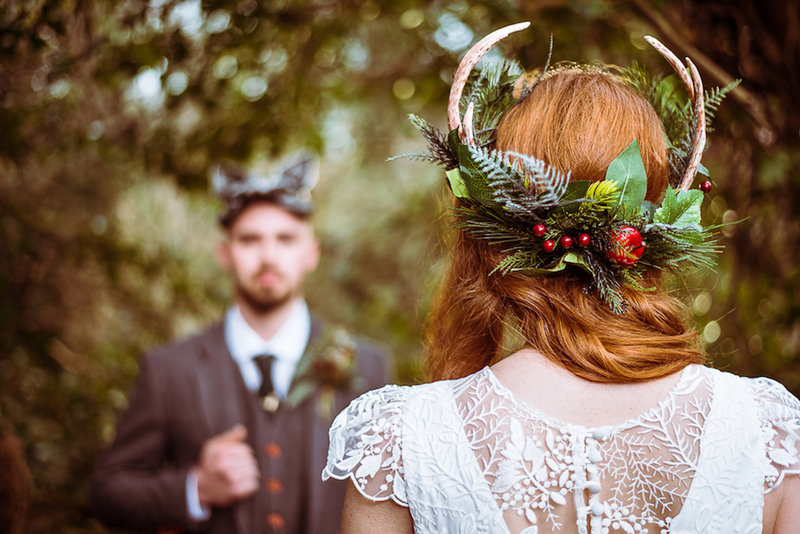 Roseanne from Flora & Fauna Fest created a festival headdress for Amber with dashes of berry red and an incredible carved fox mask for Kasey who looked the part dressed in a suit from the Vintage Suit Hire, complete with fob watch and playful tiepin. 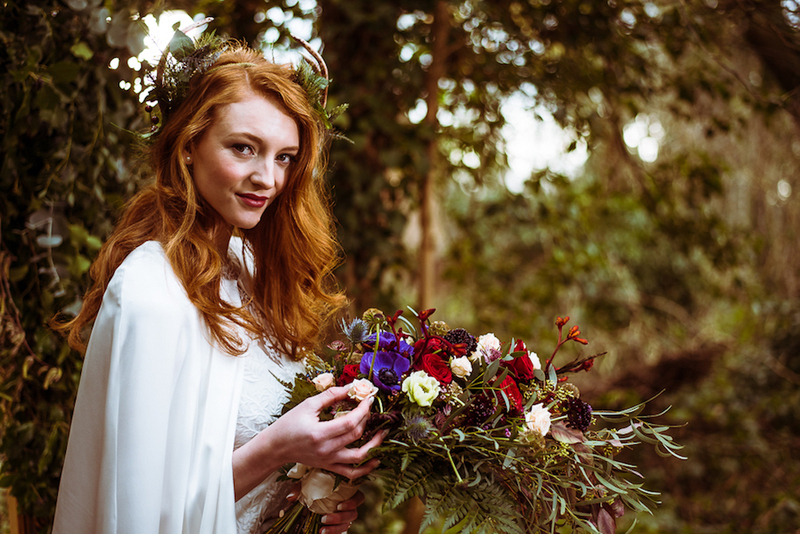 Nancy from 13 Blooms has floristry in her blood. 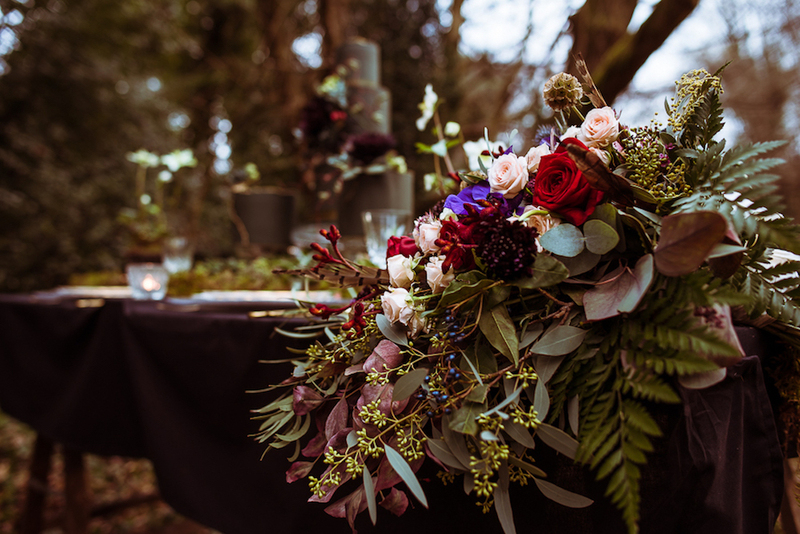 She used masses of green-berried eucalyptus, nicholi and fern to adorn the ceremony, a perfect addition in the woodland setting. 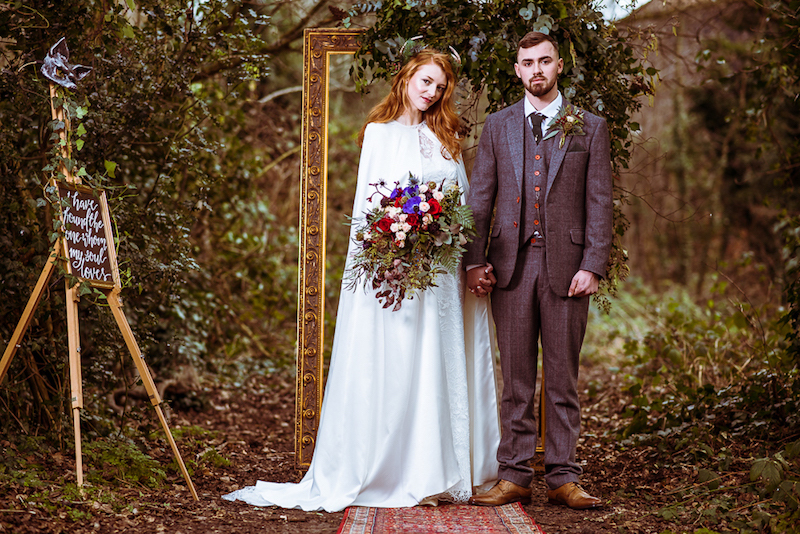 The quirky, almost ‘Alice-in-Wonderland’ oversized picture frame supplied by the amazing Herts Vintage Hire, lent itself to be an ideal backdrop. 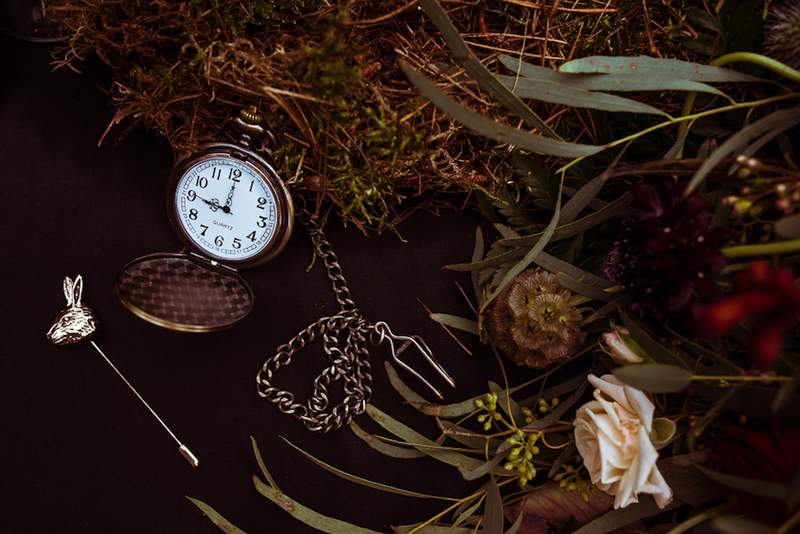 Carla has an emporium of vintage pieces and is so passionate about curating a shoot, down to every last detail. 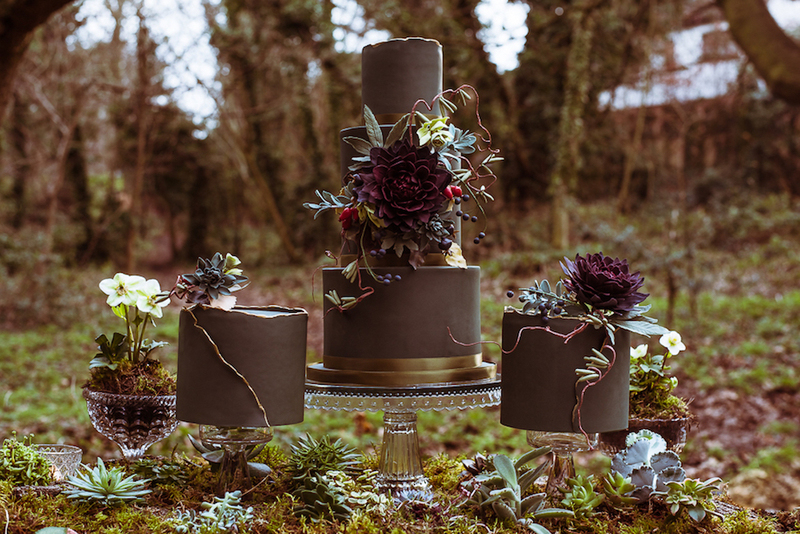 The Cakes from Iced Cake Delights were an elegant matching green, tipped with gold and beautiful sugar dahlias adorned them. 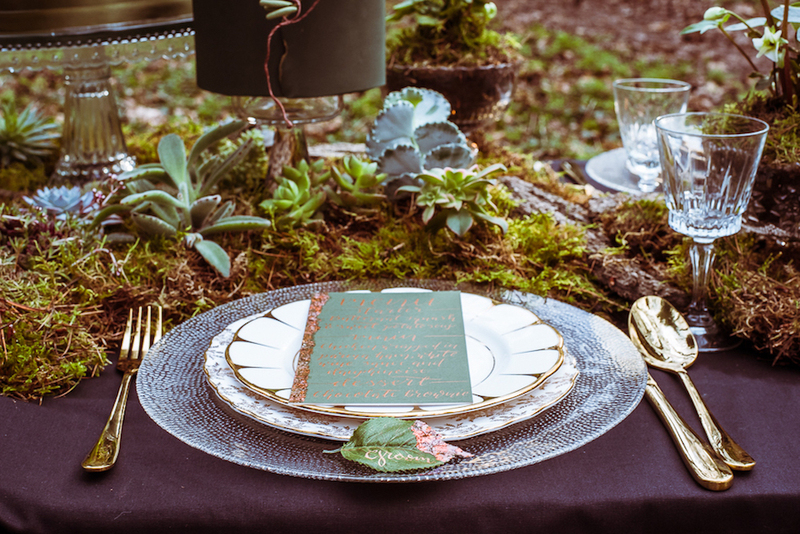 Copper and gold highlights on the leaf place names and menus from Inviting Writing complemented the look. 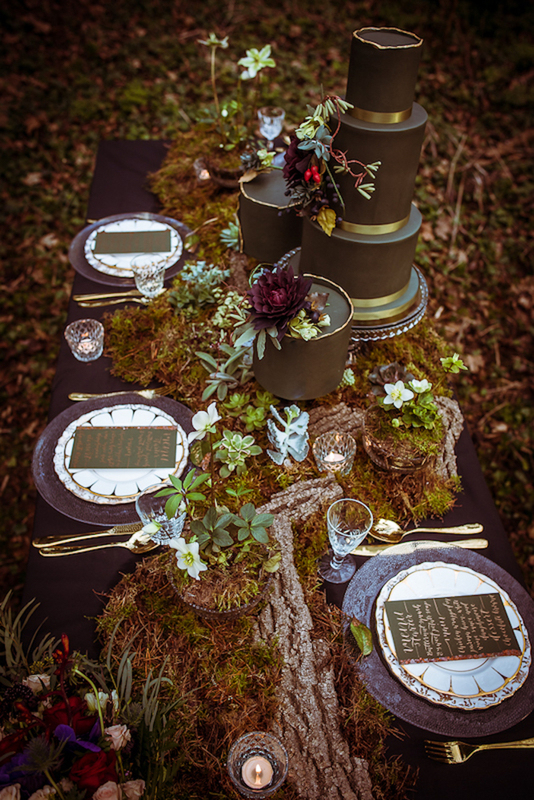 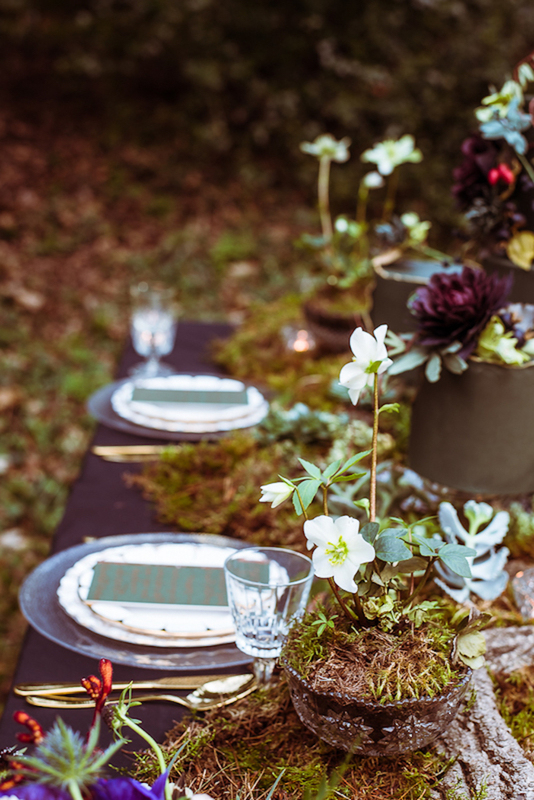 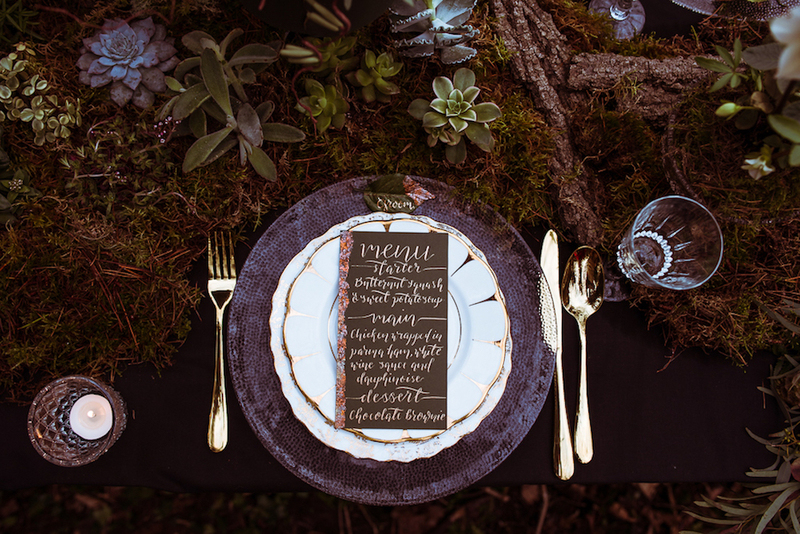 It was a truly gorgeous tablescape of glass and metallic with succulents and moss threaded through the centre to create an enchanted feel, accented with hellebores which gave a touch of floral artistry to the luxe setting in a wooded glade. 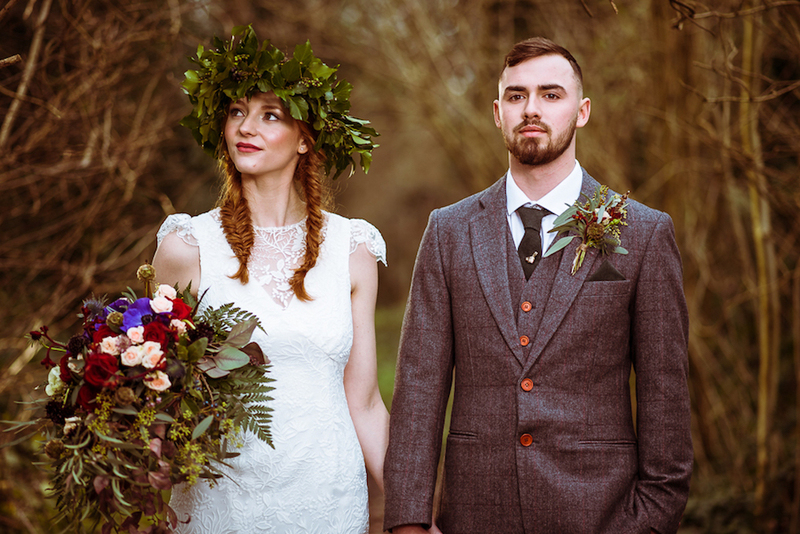 A MASSIVE thank you to Lisa and her team for sharing this shoot with us.